Place cheese cubes in small reasealable freezer plastic bag; seal bag, and freeze at least 1 hour. Heat oven to 375°F. Line 15x10x1-inch pan with foil; place wire rack in pan. In large bowl, mix beef, Sriracha and Worcestershire sauces, onion powder and salt. Shape mixture into 18 (1 1/2-inch) balls. Press thumb in center of each to form an indent. Press 1 cheese cube into center of each ball, sealing it inside. Flatten each ball slightly and place on rack. Bake 20 to 23 minutes or to internal temperature of 160°F. Cool 2 to 3 minutes. To assemble each slider: Place flat side of donut hole on bottom. Layer a piece of bacon, burger, lettuce, pickle and tomato half. Top with other half of donut hole. Secure all with wooden skewer. Sprinkle with jimmies. Serve immediately. Freeze cheese cubes up to 2 days in advance. Make meatballs ahead of time; insert cheese when ready to bake. Try different cheeses - mozzarella string cheese, pepper Jack. To make portioning balls easier, use a 2-tablespoon cookie scoop. Bacon is a snap to cook when using the oven. Heat oven to 400°F. Line a cookie sheet with sides with foil; place a wire rack on top. Place slices of bacon on rack; bake 15 to 20 minutes to desired crispness. What to do when you’re craving a burger and a donut? Sure you could eat one or the other, but why not indulge in both at the same time! And now you can with these bite-sized Juicy Lucy Donut Sliders- an ingenious fusion of the Munchies Best Bites categories for Best Burger and Best Donut. Tiny burger patties are shaped from ground beef mixed with Sriracha and Worcestershire, stuffed with cheese, and grilled to perfection. 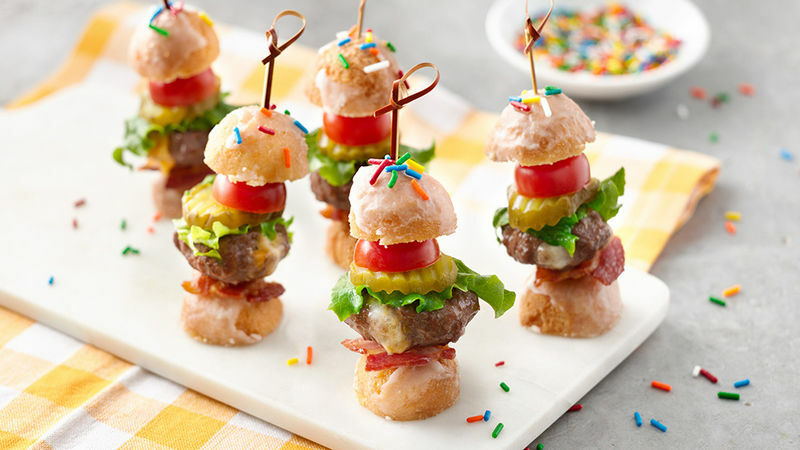 Then these mini towers of deliciousness are quickly assembled with bacon, lettuce, pickle, cherry tomatoes, and sandwiched between two sweet, cakey donut hole halves. It's sweet and savory bite-sized perfection!